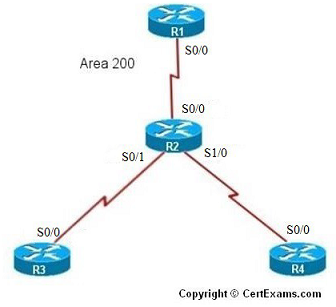 Description: The purpose of this lab is to troubleshoot OSPF routing protocol with an area ID 200 and check for connectivity. 8. Issue “show running-config” command on R3 to check the output. 1. Select R1 from Select Device drop down box. 2. Choose configure > Interface Management > Interface and Connections. 4. Configure the IP address as 192.168.1.1 255.255.255.252 and enable the interface status. 5. Choose Router > Dynamic Routing select OSPF from the protocol list and click Edit button. 6. In the Edit IP dynamic routing window enter OSPF process id 1 and click add button to add a network. 7. Enter 192.168.1.0 as network address , wildcard mask 0.0.0.3 and area 200 and click OK button. 8. Select device R2 from Select Device drop down box. 10. Select R3 from Select Device drop down box. 12. Select R4 from Select Device drop down box. 16. Issue “show running-config” command on R3 to check the output. 17. Issue “show ip protocols” command on R3 to check the output. 18. Select device R3 and Choose Router > Dynamic Routing Select OSPF from the protocol list and click Edit button. In the Edit IP dynamic routing window enter OSPF process id 1 and click add button to add a network. Enter 192.168.1.4 as network address , wildcard mask 0.0.0.3 and area 200 and click OK button.